The success story of Colombian Ana María Rodríguez, alumna of the EADA International Master in Marketing 2007-2008, is the story of a dream come true. Her great passion for marketing brought her to Barcelona to study in EADA and forge her career in this constantly evolving field. After completing the master, she has reaped one success after another in the field of wine and spirits in her country, first as brand manager of Jack Daniel’s and more recently as Senior Brand Manager of Heineken for Central Cervecera de Colombia. When did you first begin to take an interest in things related to marketing? From when I was very young; even then, I saw business opportunities all around me. Maybe that’s why, when I began thinking about what I wanted to do, I always came back to marketing. What interested me most was creating successful brands and designing strategies that attracted consumers to a specific product. What was the most important thing that you learned at EADA? The EADA International Master in Marketing enabled me to learn everything needed to manage the marketing area in a very real way. In each class, we studied a real case from a company, covering issues related to pricing, brand positioning and consumer behaviour, among other things. What’s more, I was able to do an internship in UNipost, which was a great experience because I got the chance to put into practice everything I had learnt in class. Just two months after finishing the master, I joined Global Wine and Spirits, a wines and spirits distributor and importer, where I took on various marketing functions for important brands such as Jack Daniel’s, Vodka Finlandia, Tequila Jimador, Tequila Herradura, Amaretto and Sambuca Luxando. Among my main functions were activities related to brand positioning, marketing plans, advertising campaigns and strategic alliances and sponsorships. In other words, everything I had dreamed of was coming true. The big leap came four years later when you became Brand Manager in Colombia for Heineken. How did you take this transition? After working for four years for big wine and spirits brands in Colombia, I had amassed expertise on how the market worked from all perspectives: the media, sponsorships, suppliers, customers, etc. The positive results I achieved at Jack Daniel’s were key to making contacts in the sector, and to eventually receiving the offer for brand manager in Heineken in Colombia. For three years, I took on the responsibilities of Marketing Manager: drawing up marketing plans (from planning to implementation) and product budget estimates for imports, defining the pricing strategy, dealing with sponsorships, relations with agencies and suppliers, etc. 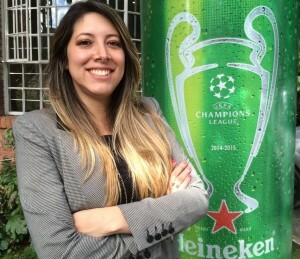 Last year was also very important because you became Heineken Senior Brand Manager for Central Cervecera de Colombia. How did this new challenge come about? That’s right. In February 2015, Heineken decided that its distributor in Colombia, Global Wine and Spirits, would become its strongest strategic partner in the country. That is how Central Cervecera de Colombia was born, a joint venture between Postobon and CCU, two giant companies in Colombia and Chile, respectively. Following the merger, I was given the opportunity for the new position of Heineken Senior Brand Manager. It may sound like a cliché, but the truth is I like everything I do. Every day is different: one day I am doing an advertising campaign, and the next I am looking for something striking for a supermarket. We don’t sell beers, we sell moments and experiences with friends and family, which means exploring new initiatives that will surprise our customers. No, there isn’t. You simply need to be very excited about what you do, to be self-confident in order to accomplish your goals, and take a leap into the void without being afraid when it comes to taking on new challenges and evolving. I want to keep growing in marketing, a field that has many angles and nuances; you can ever know it all. In addition, because it’s an area that depends on consumer behaviour, it is constantly evolving, which makes everything even more motivating. New technologies and global communication are forcing companies to keep a look out for new marketing strategies that best address the needs of consumers. That’s why I want to continue learning, and keep up to date with these new strategies, and why not, perhaps set up my own company sometime in the future. I want to wake up every day and feel happy because of the road I have followed. The important thing is not so much to reach the finish line, but the road you have taken to get there.